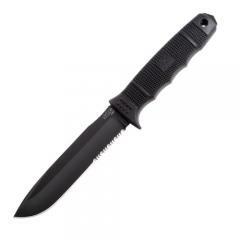 SOG SE38-N SE38 Force Knife FREE SHIPPING! Durable, rugged and tough, the SOG SE38 Force Knife truly is a force to be reckoned with. The blade is constructed from AUS-8 steel and coated with a hard-cased black TiNi finish, creating a long lasting, razor-sharp edge that will not corrode in the elements. A full tang design features nearly a quarter-inch thick spine that runs the length of the knife to create a virtually unbreakable blade. The tang extends from the rear of the handle to offer a steel tip capable of breaking glass or delivering devastating melee blows. The contoured, glass-reinforced handle provides maximum comfort while its textured exterior delivers a reliable grip and improved control. An included MOLLE compatible nylon sheath ensures the Force is always with you. ©2002-2019 CopsPlus.com: SOG SE38-N SE38 Force Knife FREE SHIPPING!